Tre'r Ceiri is a spectacular Iron Age hillfort standing at a height of 485m on the easternmost of the three peaks of Yr Eifl on the Llyn Peninsula. 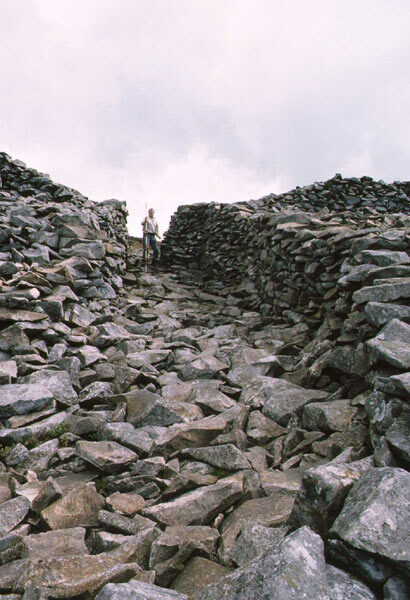 The hillfort is surrounded by a massive dry-stone wall which stands close to its original height of 3.5m in many places. A further outer defensive wall, constructed from massive blocks of stone, guards the north-western side of the fort. A well-defended pathway passes through both the inner and outer walls and this was probably the main entrance. Four smaller entrances have also been identified, the most unusual of which is a narrow covered passage through the rampart at the north of the site. Within the ramparts are the remains of in excess of 150 dry-stone huts. These are found in several dense groups around the fort. The earliest huts were large roundhouses. Many of the later huts were built around these and exhibit great variation in form, ranging from simple circular huts to rectangular and irregular structures. 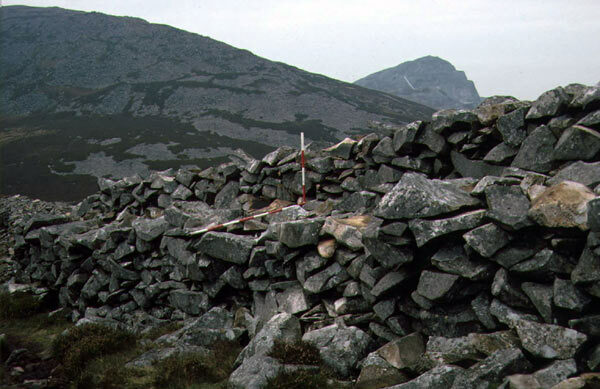 The highest point of Tre'r Ceiri is marked by a Bronze Age cairn. A conservation project was set up in 1989 in response to concern about accelerating rates of erosion to the fragile dry-stone masonry. The main points of weakness were collapses in the rampart and hut walls which were severely compromising the stability of the surviving masonry. It was decided to consolidate the masonry by rebuilding the collapses using original building styles and to mark the new masonry with small drill holes. The project involved ten seasons work and a detailed report was produced at the end of each season. All masonry was recorded before, during and after conservation as series of rectified photographs using a shift lens on 35mm SLR cameras. The reports contained all relevant photographs along with drawn records and written descriptions. Three new information boards were erected on site at the end of the project and the footpaths approaching the fort were upgraded. A long-term management plan was also produced, recommending regular monitoring visits in order to arrest any erosion or deliberate damage before the onset of significant deterioration in the stability of the monument. The consolidation did not involve any formal excavation and one of its key aims was to avoid the disturbance of in situ deposits. The removal large amounts of rubble, however, uncovered many previously undetected features. Of particular note was recovery of Roman pottery in a remodelled element of the main entrance demonstrating that the site was occupied and was being refurbished during the Roman occupation. Much new information was also discovered about the structure and phasing of the groups of huts within the fort. 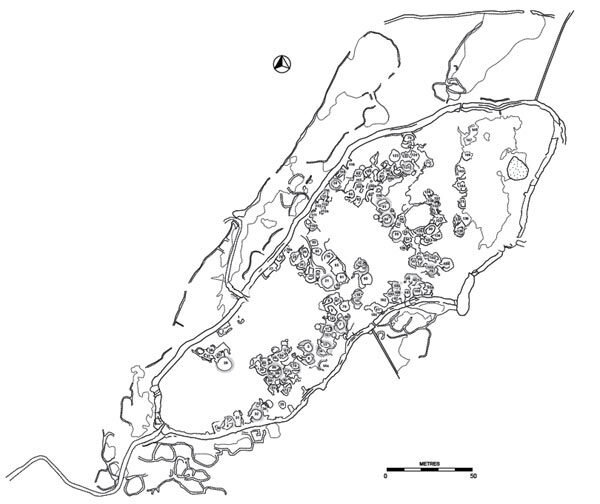 Summaries of some of the work were published in Archaeology in Wales but a detailed report was not published at the end of the project. The 10 annual reports were all produced when digital recording and copying were in their infancy. Each report consists of two volumes, one containing the text and plans and the other containing up to 441 plates consisting of gloss prints glued onto individual sheets of paper. Photocopies were produced and deposited with the HER and Cadw. These are, however, of poor quality by modern standards. The unbound master copies were recently examined and were found to be deteriorating. Most of the information from the conservation project has not been published and is thus not available to researchers and the general public. Almost all of the important information from the projects is contained in the 10 detailed annual reports. These contain 2325 photographs and 10 volumes of text and plans. These were digitally scanned in partnership with the Visualising Gwynedd Project. The work was overseen by Sian James, the Digital Media and Public Archaeology Knowledge Transfer Partnership Research Associate at the School of History, Welsh History and Archaeology. Guided walks were undertaken both for the general public and for local schools and a self guided walk leaflet was also produced. A day of archaeological activities with a focus on Tre'r Ceiri was held during the Festival of British Archaeology at the nearby Nant Gwrtheyrn Welsh language and conference centre. The site and guided walks were also promoted during the Urdd Eisteddfod. The information arising from the 10-year conservation project has been synthesised into a paper suitable for publication in a peer-reviewed publication. 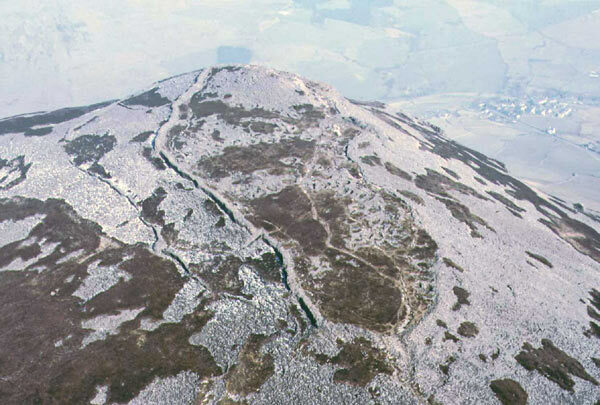 It will be submitted to The Archaeological Journal which has previously published major papers on Tre'r Ceiri. A new detailed plan of the site has been produced. This required additional on-site survey work in order to provide a base plan for the detailed site drawings produced during the conservation project. The information in the 10 volumes of reports has been summarised to produce an overview of the work undertaken and highlight revised thinking on the phasing and dating of the monument. After discussion with the editor of the journal this requires some final revisions and will be formally submitted by the end of 2013. The site has been examined in detail and has been assessed for stability. A variety of issues involving erosion, access, damage, provision of information to visitors and the condition of the monument have been identified. This information has been used to produce a new management plan. This includes an annotated map showing areas where problems have been identified. There are also currently issues with access and signage. Gwynedd Council has a management agreement with the landowner. GAT has previously worked with the Council to provide interpretation boards and footpath management. The management plan will inform further works by the Council which will include measures for better signage along with refurbishment or replacement of the existing interpretation boards possibly in conjunction with the Llŷn AONB.